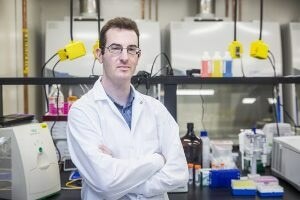 Professor Ryan M. Gelfand from the University of Central Florida is part of a research team that produced a graphene-based transistor capable of developing computers, in the future, that use a hundredth of the power besides being a thousand times faster. When he began researching the concept with fellow Grad Student Joseph Friedman, who is presently an Assistant Professor at the University of Texas at Dallas, Ryan M. Gelfand, an Assistant Professor at CREOL, The College of Optics & Photonics, was a Graduate Student at Northwestern University. Standard silicon-based transistors modernized electronics with their potential to switch current on and off. The creation of smaller radios, computers and televisions was allowed by transistors as they were able to control the flow of current. This month’s issue of the scholarly journal Nature Communications features a report in which Friedman, Gelfand and their fellow Researchers theorized a future-generation transistor, based on a ribbon of graphene and not on silicon. Graphene refers to a two-dimensional carbon material with the thickness of a single atom. The outcomes have huge implications for big data, computing speeds and electronics, stated Gelfand, who came to UCF in the year 2015. If you want to continue to push technology forward, we need faster computers to be able to run bigger and better simulations for climate science, for space exploration, for Wall Street. To get there, we can’t rely on silicon transistors anymore. Researchers discovered that by applying a magnetic field to a graphene ribbon, they could alter the resistance of current flowing via it. For this particular device, the magnetic field is controlled by decreasing or increasing the current through neighboring carbon nanotubes. This aspect of increasing or decreasing the strength of the magnetic field could also increase or decrease the flow of current via this new type of transistor, similar to a valve controlling the flow of water via a pipe. Transistors behave as on and off switches. A series of transistors in varied arrangements behave as logic gates, permitting microprocessors to solve complicated logic and arithmetic problems. However, the speed of computer microprocessors that depend on silicon transistors has been comparatively stagnant for a number of years, with clock speeds frequently in the 3 to 4 gigahertz range. A cascading series of graphene transistor-based logic circuits could develop a massive jump, with clock speeds nearing the terahertz range – a thousand times faster. Gelfand stated that it is also possible for these circuits to be smaller and considerably more efficient, permitting device-makers to minimize technology and then squeeze in increased functionality.